This week on TVV, a new series for the month of VEGANUARY! If any of you follow along my Instagram, you’ll for sure have seen some of these photos. Obviously the less than stellar photos in this post were taken from my iPhone, while the more of my usual standard photos were taken with my actual DSLR. I’ve been a little burnt out of my usual noodle recipes and go-to rice dishes so I decided to give back this Veganuary and feature some amazing cookbook authors as I revitalize my palate and kitchen habits with some new recipes. There are just so many to feature and I’ve picked four amazing vegan cookbooks to showcase on TVV this month (don’t worry, there’ll be recipe posts this month as well). It’s been about week of me experimenting from different recipe books and it’s been so fun! I think I’ll make this a recurring project for TVV because I own a ton of vegan cookbooks and I almost never use them because I’m too busy developing recipes. It’s silly, because I absolutely love cookbooks. I love the drool-worthy photos, the various anecdotes peppered in from the author, and the unique approaches everyone takes towards veganism. For example, Angela Liddon, a fellow GTA’er in Canada has an amazing simple, and accessible approach for vegan food. For those outside of the bubble, GTA stands for Greater Toronto Area, which is basically an hour’s drive radius around Toronto because living in the city is both amazing and awful while also being ridiculously expensive. All of the ingredients that Angela uses in her recipes are easily available at your local grocer or health food store. I was surprised that I had almost all the ingredients for the majority of the recipes, I only had to run to the store to get a bunch of celery or a lone pepper that I spread out between a few different recipes. Vegan kitchen staples like tempeh, tofu, tamari, maple syrup, lentils—all things already in my pantry. I mean, you might not always have a block of tempeh on hand, but in the GTA, that’s pretty easy to come by! I didn’t get a chance to make anything breakfasty from the OSG cookbook, but the savoury oats made with lentils looked very enticing. Much to Burrito Boy’s delight, many of these recipes are very Canadian-palate friendly (which I like to call White-People-Food). The recipes that I tried like the lentil walnut loaf, the yolos, and the chickpea salad sandwiches Canadian favourites that Burrito Boy was familiar with. Their flavour not too loud, texture wasn’t too weird, and the method of enjoyment not too far out of his comfort zone. BB is a pretty easy-going guy when it comes to food, but I think he was pleased with the decrease of Asian dishes we were eating on the regular. The lentil walnut loaf was by and large pretty good. I give it a 6.5/10. Texturally, it was pretty good. Once you let it cool down or rest, it stays together quite nicely. Fresh out of the oven, it doesn’t stick together so well. I think next time I’ll add some more spices (more garlic powder, maybe some paprika, and maybe a kick of gochujang in the mix while I’m add it), but the glaze on top was pretty good. BB really enjoyed it because it had that sweet-savoury kind of tang. The cookie dough bites were surprisingly very good. I’m allergic to almonds, so I subbed in Brazil nut meal, and it worked just fine. Not everyone has a high-speed blender to make oat flour, but most people have the personal blenders. To blend my rolled oats into flour, I used the single-cup for my Ninja—which, by the way, is an awful blender, don’t bother getting it. The only thing I use the giant motor for is the single cup blender, which is a little disappointing for the amount of counter space it takes. I think I may have been a little too generous with the chocolate chips because it got a little hard for the dough balls to stick together, but I got it to work in the end. 8/10 would eat again. I also tried the balsamic maple marinated tempeh, which was extremely easy to make and took very little time to prep. I actually quickly whisked together the marinade and tempeh in a container to bring to BB’s apartment (where there are few vegan staples at hand) to make for our lunch and it worked out beautifully! I found the twang of the balsamic a little strong for my taste, but BB seemed to enjoy it. He didn’t love tempeh that much, but he said he liked the flavour. 7/10 would eat again with some adjustments. Another thing I tried was the chickpea salad sandwich. Made to mimic a tuna salad or a chicken salad sandwich, this sandwich fulfills the mouthfeel, flavour, and satiation of those childhood classics. I used a pastry knife to “flake” the chickpeas (because I don’t have a potato masher), and I was pleasantly surprised that the three green onions the recipe called for didn’t overpower the mixture. I did have a bit of onion-breath afterwards, but nothing blatantly potent that a breath mint can’t handle. I chopped everything super fine so that you didn’t get distinct chunks of various ingredients, so the all-round mixture was tender, crisp, creamy, and crunchy all at the same time. 9/10 will definitely eat again, although I may leave out the peppers for BB’s sake (he loves spicy peppers but he does not really care for bell peppers). This recipe caught my eye at the cringe-inducing title (I believe it was named before the Drake song hit the airwaves though). These “yolos” are vegan versions of Rolos, a childhood favourite of mine. The book simply calls for inch-sized balls to be rolled and dunked in chocolate, but I decided to make them resemble Rolos a bit more and add a bit of spiffy flair by sprinkling the bottoms with fleur de sel, so you get a salted caramel experience. I wish that the recipe didn’t use peanut butter to help bind the date caramel together because I found the peanut butter overtake the caramel flavour just a bit, but it was super delicious all the same. Rich, creamy, chocolaty with a hit of salt? Yum. I even brought some down for the very carnivorous concierge who does the night-shift of my building and she was pretty impressed that it was vegan. Booyah! There are a bunch of other recipes that I want to try but didn’t have a chance to make like the garlic-seared tofu and the classic Glo bars. I actually have only seen brown rice syrup at a health food store once before, but I’m pretty sure that since I use maple syrup and regular cane sugar most of the time, I don’t pay attention to other sweeteners. Once I get my hands on some brown rice syrup, you bet your yolos I’ll be making some Glo bars. Have you tried any OSG recipes? With her charming writing, beautiful photography, and delicious recipes, she’s kind of a legend in the vegan world. Even though I know lots of people who have met her or are friends with her, she still seems to be this elusive vegan goddess enigma that made it big in the vegan blogging world without having to jump through the hoops that any successful blogger has to dive through today. Now for the giveaway I’ve been teasing since I started this project in December: SO MANY COOKBOOKS! 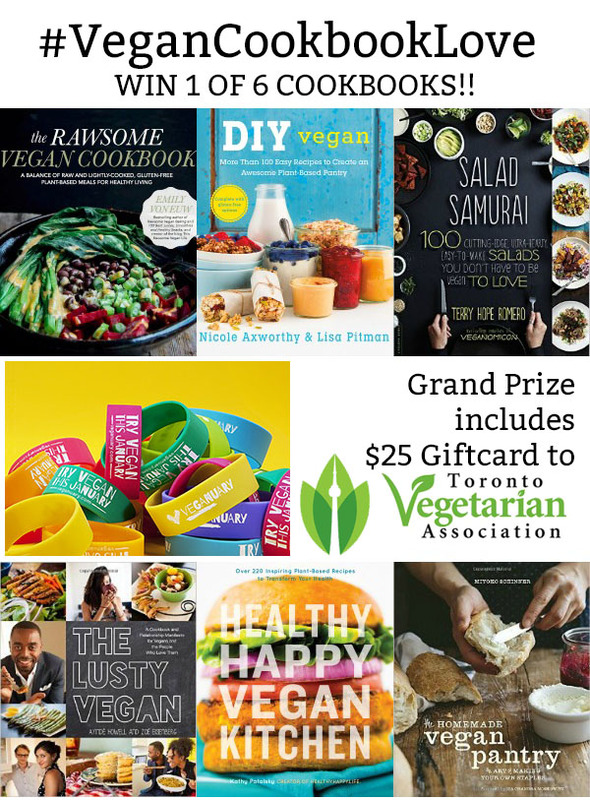 I was so fortunate to have the Toronto Vegetarian Association team up with me and two other bloggers to give away so many awesome vegan cookbooks! The TVA gave me a copy of The Lusty Vegan, The Homemade Vegan Pantry, and DIY Vegan (by fellow Canadians Nicole Axworthy from A Dash of Compassion and Lisa Pitman from Vegan Culinary Crusade), as well as a $25 gift card you can use at the Resource Centre (where I volunteer twice a month!). There you can find TONS of vegan cookbooks, DVDS, and other books about how to rock on and be plant-based. And not to mention, both Emily Von Euw from This Rawsome Vegan Life and Kathy Patalsky from Happy. Healthy. Life. contributed their cookbooks to the prize! Respectively the Rawsome Vegan Cookbook and the Happy Healthy Vegan Kitchen cookbook. And before I forget, Joann from Woman in Real Life also has sweet sweet connections and scored us a copy of Salad Samurai for the giveaway as well. Basically, its a big ol’ giveaway bonanza with a ton of prizes for my fellow Canadians (including Quebec!!). Sorry Americans, I can’t afford to ship 6 cookbooks south of the border right now, but if you hop over to Joann’s blog, both my US friends and Canadian friends can win a copy of Salad Samurai. Great choice on the first cookbook to start your series! When you get a chance to make them, the savory oats are delicious. My favorite recipe from OSG, though, is her creamy tomato soup with roasted chickpeas on top. It takes me back to being a kid again. I don't really have a favorite cookbook, because I love so many. One of my favorites is Chloe's Vegan Italian Kitchen. Everything I've tried is awesome. I recommend the baked tempeh in mushroom cream sauce. Dang! I thought I posted a long comment this morning but it seems I did not click submit properly. I am coincidentally on a big Oh She Glows binge the past two weeks! Robby's aunt, who is not veg, mentioned she got the book recently and is loving it! So that inspired me to flip through it again and I've been having a fantastic time! The chickpea salad you mentioned happens to be on my lunch menu for tomorrow. Here are some other things I'd highly recommend: YES! The garlic tofu you mentioned. It is one of our staple recipes now, great when we want to have some kind of veggie as a side and something hearty to go along with it. Another favourite is the cashew brocolli burritos, love those! This week I made the lemon tahini salad dressing and oh my god. It is the most excited I have ever been about a salad. Eating it is just as good as eating our main course or dessert, seriously! Tonight I just made the chia seed donuts, but I didn't have oat flour so I used spelt, and I used muffin tins instead. They turned out really good. There is nothing bad in them for you yet they taste sweet like a treat! *bows to maple syrup* Those are the recipes that stand out at the moment. We also regularly make the overnight oatmeal and overnight chia pudding. I've also made the chia seed jam before! (Until I bought this book I refused to ever buy chia seeds because I thought they were just an expensive foodie trend. Luckilly we've discovered the massive bag you can get at Costco!). Thanks for the inspiration to try the rolos! I'll try those chia seed donuts sometime! I was a little skeptical at first, but everyone of her recipes I've tried have been great so I don't know what I even bother doubting! My favourite cookbooks are the ones in the Happy Herbivore series. I love making the Cajun Stuffed Mushrooms in Happy Herbivore Holidays and Gatherings.P.S. I accidentally entered the wrong twitter handle for my entry for the Viet Vegan's twitter... I am following: @katiebuys! Thanks Katie =) I'll mark that down for when I'm selecting winners. My all time fave vegan cookbook is Veganomicon. It's hard to pick a fave recipe but I always love the leek and potato cassoulet. My favourite go-to cookbook is OSGs. I love the yolos and the sweet potato enchiladas, as well as the granola.My favourite for decadent party food would be nom yourself. I love the tofu tacos and buffalo cauliflower salad. So much oil and mayo in the cookbook, but meat eaters would never know the difference.